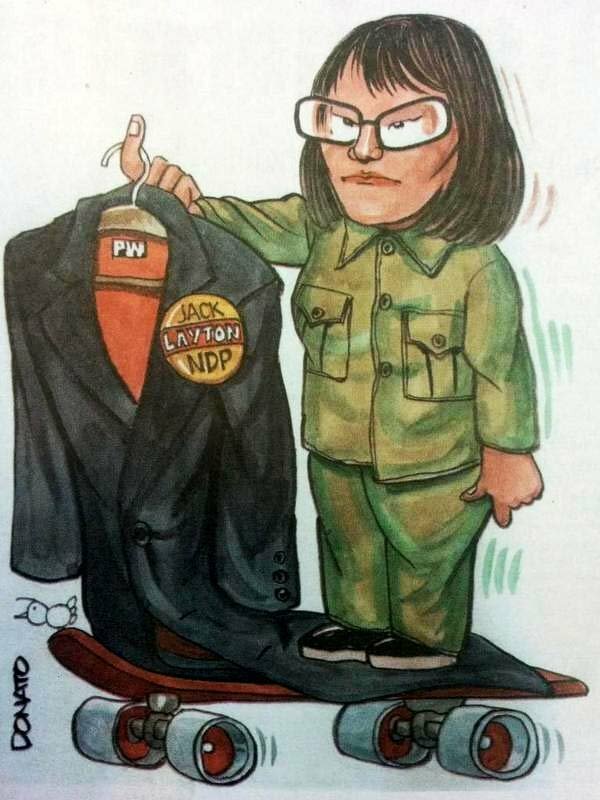 On Sunday, the Toronto Sun ran the above cartoon (by Anthony Donato) on this cartoon of Olivia Chow. Chow denounced the cartoon as “racist” and “sexist” (two characterizations I agree with). I thought it would be productive to find out what Paul Godfrey, who runs the large media outfit that is about to buy the Toronto Sun (and who ran the Sun years ago) thought about this. Our conversation from last night and today, carried out on email, is pasted below. My name is Jeet Heer. I’m a freelance writer — I’ve written for many publications including The New Yorker, The Guardian, the Globe and Mail. Many moons ago I used to work for the National Post, where I was a columnist. As you will see, the cartoon depicts Ms. Chow rather in the manner of a Kim Il-Jung, as a malevolent dwarf. The imagery calls to mind the depiction of Asians in “Yellow Peril” cartoons of the early 20th century. Many people, including Chow herself, called this cartoon racist and sexist. As the prospective owner of the Toronto Sun, I want to know whether you think this cartoon is, as the paper you are purchasing insists, not racist and not sexist? Can you please answer this question. I will be happy to quote your answer (or non-answer) the article I am working on. Jeet, I did not see the cartoon in question so for that reason it is difficult to give you an opinion on it. Secondly as a person who has been the the subject of jokes/ridicule etc in cartoons in many publications over the years I fully realize that newspaper cartoons poke fun at public figures surrounding serious topics. All you have to do is take a look at today’s newspapers. I have learned from personal experience to smile and move on. The public usually do the same thing. Since Mr. Donato will soon be in your employ and he’s the person most closely associated in the public mind with the Sun Media (having been at the Toronto Sun since its inception in 1971), perhaps you can look at the cartoon and offer an opinion. I have now seen Andy Donato’s cartoon. I have always thought Donato to be one of the finest cartoonist in Canada. In fact, I continually refer to him as the Franchise of the Sun chain..
Having said that I repeat what I stated in my previous email to you. Cartoons in newspapers often poke fun at serious news items and that was what he is doing here. Donato is neither racist or sexist. I know that because I worked with him for almost 16 years, He has often poked fun at me in cartoons for years making fun of my surgically corrected jaw. People who enter all forms of public life may from time to time not like what a cartoonist produces. I do not believe he crossed the line of good taste on this cartoon.